I’ve been decking my halls and trimming my trees for my Christmas Home Tour (take the tour here)! But sometimes it can get overwhelming. 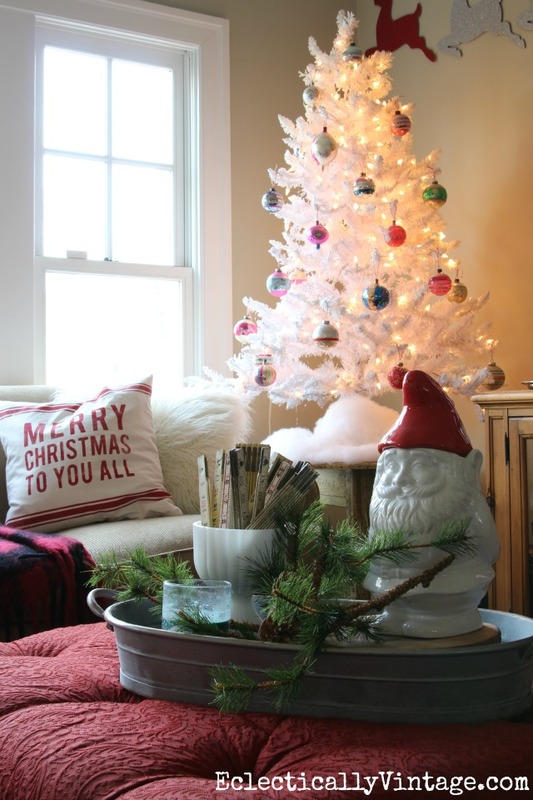 Here are my tips for surviving Christmas decorating while still getting the most bang for your decorating efforts. Decorating takes time and the sooner we start thinking and planning, the easier and less overwhelming it becomes. Although you may not be putting your tree up until after you carve your turkey, you can still peruse magazines, Pinterest (and my blog!) for ideas to get you ready (and so you can order whatever you need in advance – make sure to check out my Top Christmas Home Decor Finds Under $25). Decorating is a process and lots of changes are bound to take place. Starting early helps us figure out exactly what suits us best. It’s easy to forget what we have stored away in boxes and bins 11 months of the year. Pull out your stuff and look at it with fresh eyes. I love moving things around the house. The mini trees I used on my mantel last year, I plan to put on my stairs this year. The white Christmas tree that has been in my kitchen and family room will make an appearance in my dining room this year. It’s all about using what you have in new ways. Whether you check out online shops or head to your nearest HomeGoods or Target, it’s fun to see what’s new and different. You may find a show stopper that becomes the backbone of your decor. 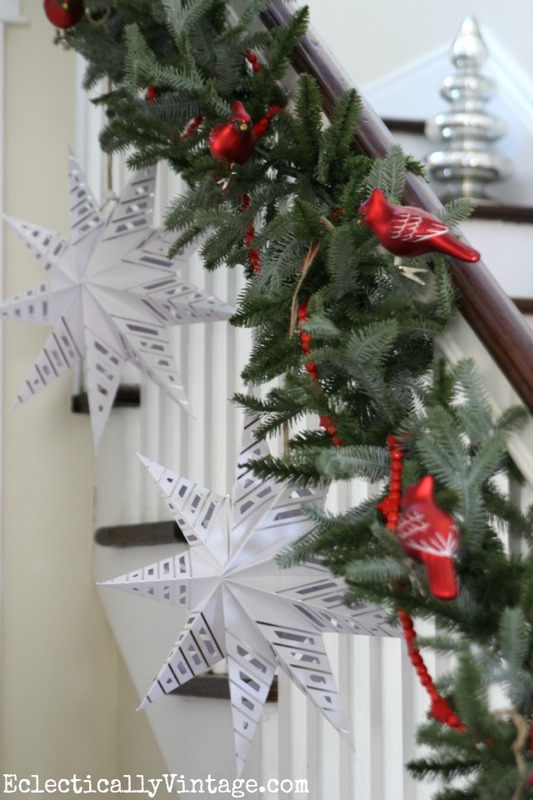 Whether it’s a color (I’m all about red and white this year) or an idea like snowflakes or stars or mercury glass, picking a theme makes it easier to edit your decorations and use only what fits. Shopping early (tip #3) helps you decide what direction you want to go. Figure out which area in your home is the most important to you and start there. It could be your kitchen or dining room or mantel. Use that as a jumping off point. My main areas to focus on are usually my mantel, dining table, kitchen and staircase. 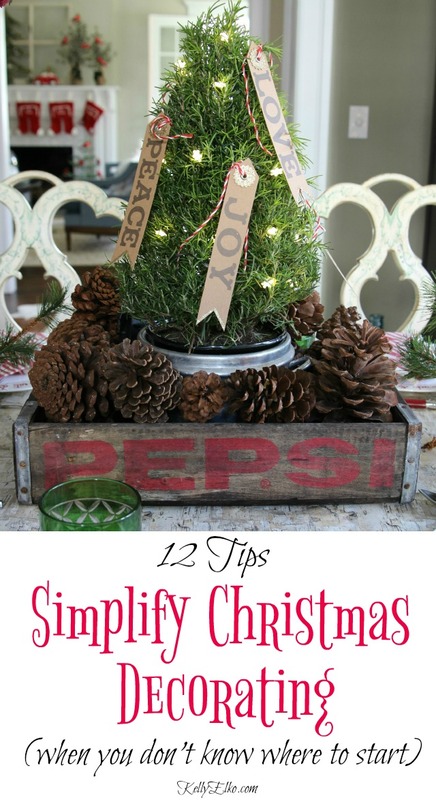 The rest of my house gets a mini tree or a bowl of vintage Shiny Brites – super simple. I decorate early and don’t have time to mist fresh garlands and wreaths – I save those for my front porch. Inside, I’m all about faux trees, wreaths and garlands. They are no fuss, no mess and can be used year after year. 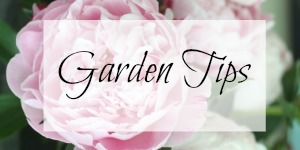 Sprigs of faux greenery can be tucked into vases or galvanized buckets. Faux berry garland can be cut up and scattered on coffee tables or tied to Christmas presents. 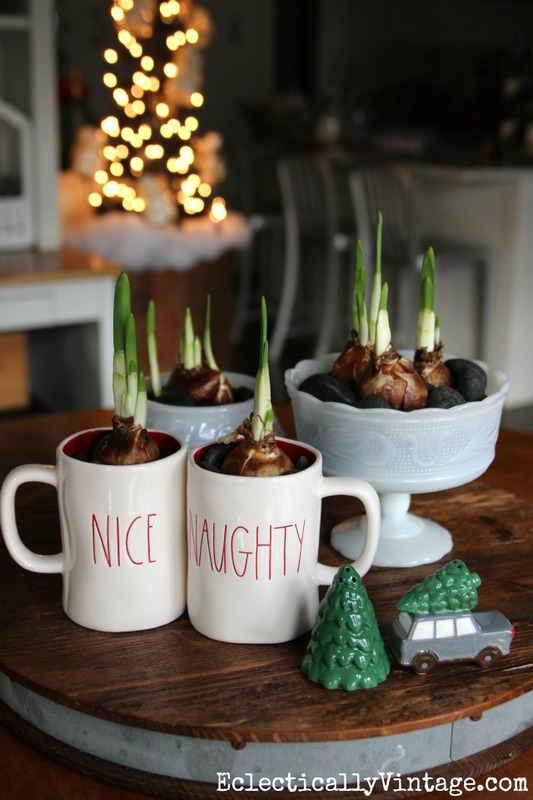 Force bulbs (see how to force Amaryllis bulbs in jars) early so they are in bloom for Christmas. Add a tiny rosemary tree or a few fresh sprigs of holly throughout the house. The key is to use things that last and won’t shed or create a mess. Best part – you can keep these fresh greens around until you have to gift them to your favorite people. Think beyond the obvious and use everyday items that can stay out all winter long. 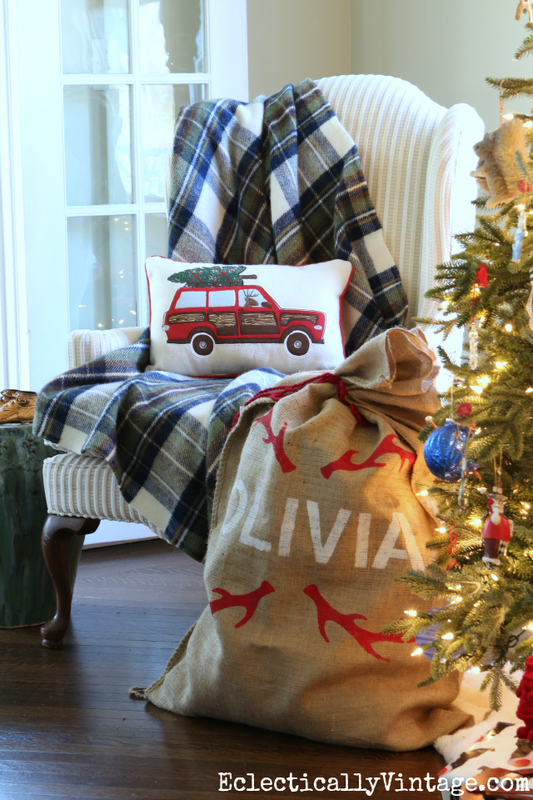 Plaid pillows and fleece throws add a subtle touch and you can mix in a cute Christmas themed pillow or two for good measure. It’s amazing what adding string lights throughout the house does to make your house merry and bright. Add battery operated lights to wreaths, tuck them into centerpieces and add them to garlands for a house that glows. I am all about these remote control fairy lights this year! Don’t be afraid to do it yourself to get exactly what you’re looking for. 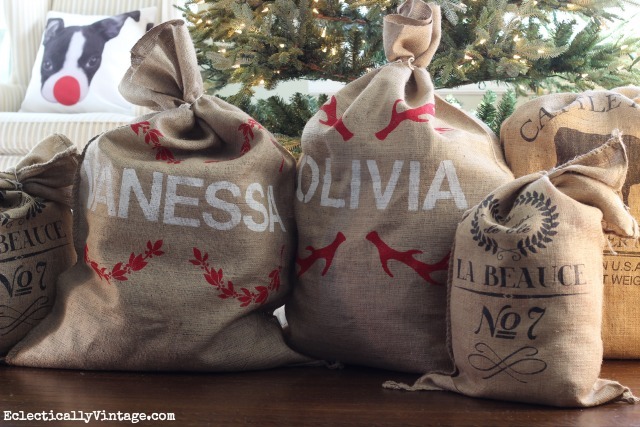 Some of my favorite Christmas decor include things I made myself like a birch wood stenciled wood backdrop on my mantel, quick and easy snowy mason jar candles and personalized Santa sacks. It’s fun to get creative with displays this time of year. 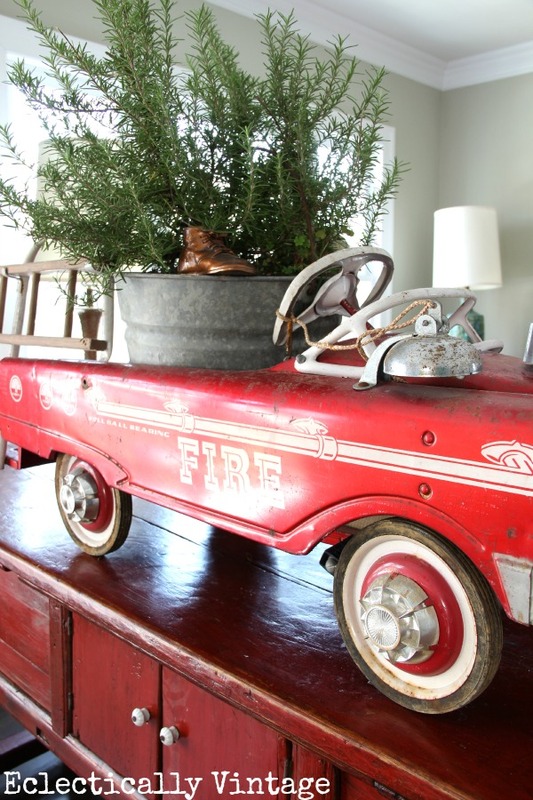 A unique flea market find or family heirloom like my husbands childhood firetruck is the perfect Christmas backdrop – just add a mini tree and you’re done. I’m always on the lookout for Christmas decor and scour flea markets and estate sales for vintage Shiny Brite ornaments or mason jars I can fill with faux snow and candles. Make sure to check out the clearance racks at your favorite stores to stock up for next year (I’ve found gorgeous mercury glass trees, red berry kissing balls and more for 90% off). Here’s to taking a deep breath and not stressing this Christmas season. Now, bring on the sugar cookies! 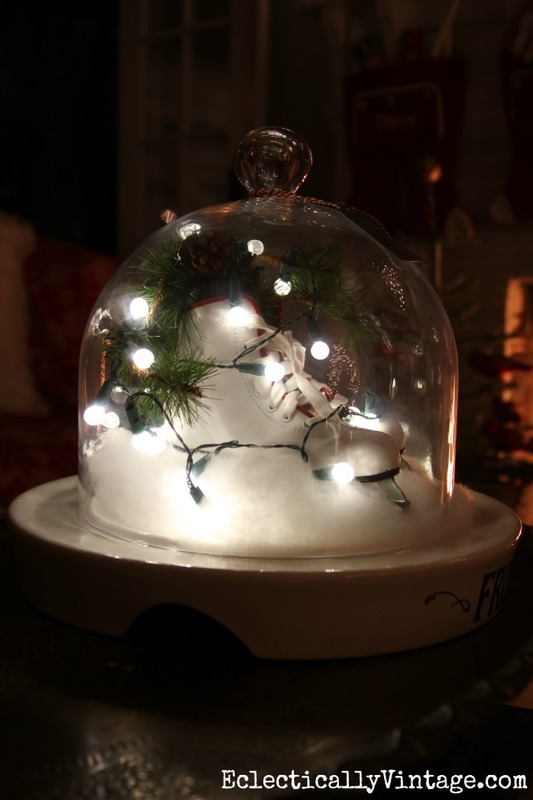 « Previous: Make Christmas Fairy Jars – Let it Glow! Lovely Kelly. I gave my daughter our small white tree and am sending her your photo. She wanted to boost her tree in front of the window in their home office and did not know what to do with it under the tree. Thanks! Great Mary Beth – it’s just buffalo snow wrapped around the base – quick and easy! Have a great Thanksgiving! 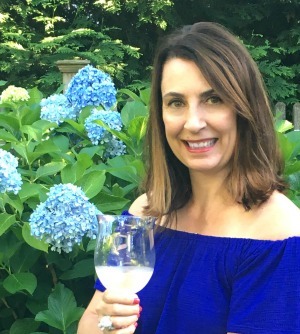 Hi Pat – yes, it’s metal and so cute! I can picture him cruising around in it trying to pick up chicks! I hope you have a wonderful Thanksgiving! It’s beautiful, we haven’t had Christmas in the last 8 years.Since my husband was hurt.This made me smile.Thank you.I recently found your page and I am loving it.Hope your holidays are bright.You made me a bit happier today. I’m so sorry to hear that your husband was hurt Cheryl! Thanks so much for taking the time to leave such a nice comment – you made my day! Thanks so much Karen – happy holidays to you too! Love the stockings. Very original. Thanks Ann – we love them too! I love the simplicity and beauty of what you have shown in this post. So wonderful you still have your husbands fire truck. I bought an old blue one that needs a steering wheel. Someone put a tire on for steering. I love the vehicles with trees. Looking forward to your Christmas tour. I spotted that little fire truck in my mother in laws basement and knew it had to come home with me! How fun that you found on too – enjoy it! 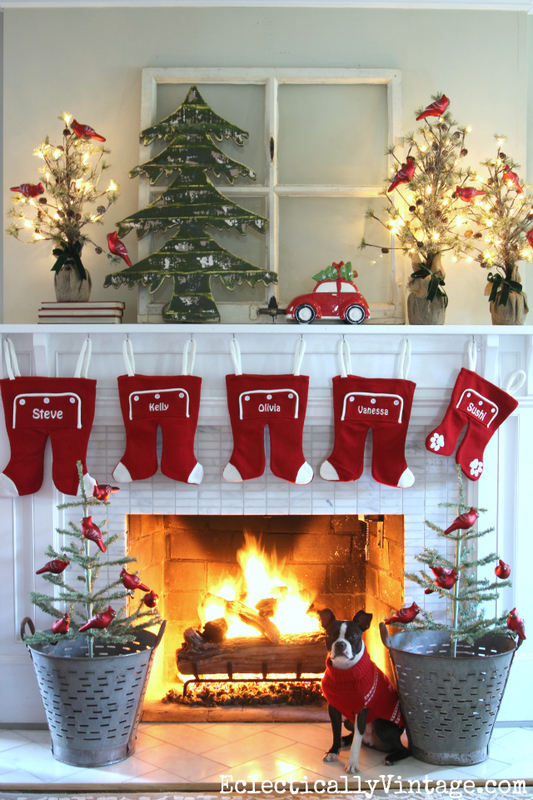 So much lovely Christmas decoration inspiration, Kelly…and the photo of your dog is awesome. Sushi says thank you Linda! Thanks so much Micki – my house has 3 floors, what a work out!! You’re not missing anything! You always have great ideas ,last year i used your cute bags idea. Have a Happy Thanksgiving with your girls and husband. Fun Marlene – I’m so happy you made the bags! Happy Thanksgiving to you and yours too! Pass the mashed potatoes! Did you make those “stocking/pants” or did you find them somewhere? Super cute!!! Really lovely and simple decorations and so refreshing after all the plastic and glitzy stuff I see so often! Thanks so much for sharing. Happy Thanksgiving!! Great advice- I love preplanning. In the last few years I have preplanned to shop the way after Christmas sales for the next year. Cheap deals and it’s fun to see what I’ve gathered. Thanks for the great tips Kelly. I also shop for Christmas gifts and decor year round. I have found some pretty amazing things at yard sales, clearance racks and flea markets. My husband would like to shoot me because my Christmas bins have doubled, but hey I love mixing it up from year to year. When I am done or over something I just gift it to someone who loves it! Where did you find the trees on your mantle? Did they come with lights?